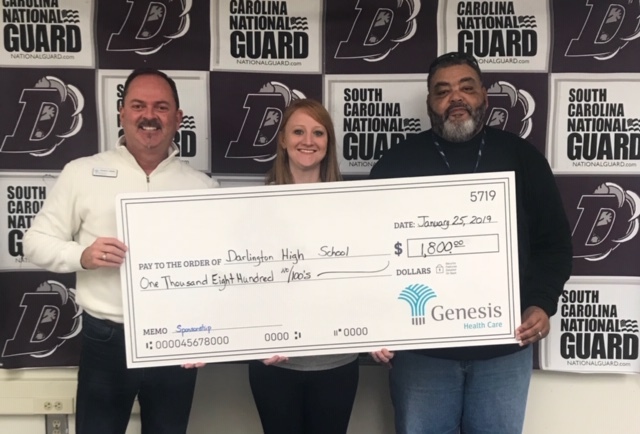 Genesis supports our local schools and athletes - Genesis Health Care, Inc.
Genesis continues to support our local schools and athletes. We are once again proud to present the Darlington High School Athletics department with a check for $1,800.00. These funds will be used to purchase much needed equipment and uniforms. Pictured are Howard Nettles – Director of Community Outreach and Recruiting for GHC, Principal Courtney Gehrke and Athletics Director Michael Jordan. Find the nearest location to schedule your appointment. We are where you are. You can find the location nearest you by visiting our locations page and call us to schedule your appointment today. When you shop at smile.amazon.com, for every purchase Amazon will donate a portion of the sale towards improving the health of your community. Sign up for our newsletter today! Its filled with articles, health tips, events, and all things Genesis. Don’t miss out on having this vital information delivered right to your inbox. Follow us on social media to stay updated on Genesis events, news, closings, articles, health tips, and many more resources to help you stay healthy and happy. © Copyright 2019 by Genesis Health Care, Inc. Website by Marstudio.